Green Tea Before Bed: Does It Make You Sleepy? Home > Food Facts > Tea > How Green Tea Helps You With Better Sleep? Tea is the most widely known and consumed beverage in the world. There are three main types of tea—green, black, and oolong. Among all the types, green tea is the most preferred one due to its health benefits. People suffering from insomnia drink green tea to promote tiredness. But, does green tea make you sleepy? Articles from The American Journal of Clinical Nutrition describe tea as a magical elixir. Green tea, in particular, is known to improve chronic illnesses, improve mood, and boost the skin health. So, can green tea help you sleep? Let’s take a look. How Does Green Tea Make You Sleepy? Green tea contains L-theanine and epigallocatechin gallate (EGCG), two powerful brain enhancers that boost cognitive and mental health. Dr. Shuichiro Shirakawa, a professor at The National Center of Neurology and Psychiatry at the National Institute of Mental Health, found that an L-theanine dietary supplement can help improve the quality of sleep in young people. L-theanine helps you wake up feeling fresh and energetic, as well as protects the mind from memory deficits and stress-linked thinking. Green tea may also help reduce obstructive sleep apnea (OSA). OSA starves the body of oxygen while you sleep. People suffering from OSA experience pauses in breathing during sleep. A drop of oxygen level in the body can affect the other organs. It may cause heart attacks, strokes, and high blood pressure. It also affects cognitive function such as learning and memory. Drinking green tea before bed reduces sympathetic nervous system activation when you are stressed and promotes relaxation. When you experience anxiety and stress, your heart rate and blood pressure spikes, respiration becomes more rapid, perspiration increases, and pupils dilate. The polyphenols in green tea prevent oxidative stress in the brain by combating the free radicals that cause it. Oxidative stress can lead to several diseases. It also prevents neurodegenerative changes related to Alzheimer’s and Parkinson’s disease. Now that you know that green tea helps you sleep, you may also want to know how to get the most out of this aromatic beverage. There are ways to get the highest possible amount of L-theanine from green tea. Researchers from the University of Newcastle in Australia found the best extraction method. Steep the tea for 30 minutes at 80°C. The water to tea ratio should be 20 milliliters per one gram. The tea leaf or granule should be between 0.5 and 1 millimeter in particle size. Drinking green tea before bed is one of the best remedies for a sound sleep. Here are some reasons why you should drink green tea before bed. If you still aren’t able to shed some pounds after a trying a couple of weight loss treatments, then it’s time to switch to green tea. What you put in your body before bed affects your health to a great extent. Drinking green tea before bed may help you lose weight faster. Your body burns very few calories when you sleep. If you replace high-calorie drinks like alcohol with green tea before bed, you will soon see the difference. For years, people have been drinking milk before going to bed. No doubt, milk is healthy, but consuming it just before going to bed may lead to weight gain because of its fat content. Some studies show that people who maintained their normal diet and consumed green tea lost an average of 2.9 pounds over 12 weeks. However, green tea for weight loss is most effective with regular exercise and an overall balanced diet. Having green tea before bed may also help lower the risk of cancer. Green tea leaves have polyphenols such as EGCG. Scientists at the Purdue University found that EGCG prevents cancer cells from growing after division. The cells didn’t reach the size required for division and were killed off. Many laboratory studies also show that green tea has antitumor effects. So, green tea may help reduce the risk of lung, breast, and skin cancers. Also, the L-theanine in green tea may help increase the effectiveness of some chemotherapy agents, but this area requires more research and evidence. Drinking green tea before bed fights oral issues. 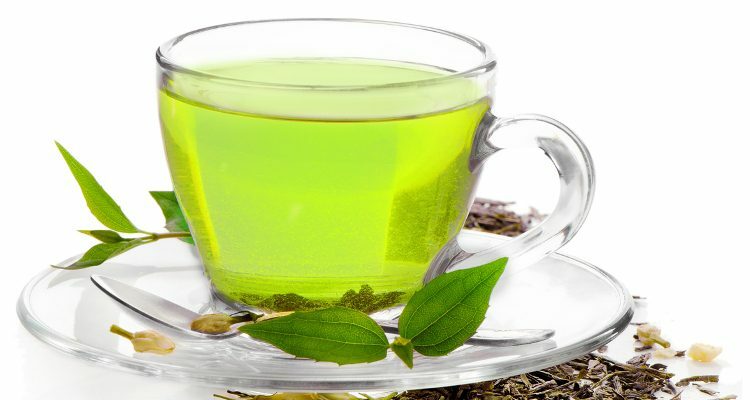 Green tea contains a polyphenol antioxidant called catechin. Catechin helps destroy Streptococcus bacteria that causes bad breath. This bacteria also lead to gum and tooth decay. Consuming green tea before bed makes your brain function better. It helps in improved cognitive functions such as clear thinking and better problem-solving. A Swiss study that used MRI scan reports revealed that people who drank green tea had greater activity in the working memory area of their brains. According to a study published in the American Journal of Respiratory and Critical Care Medicine, the antioxidants in green tea prevent cognitive problems. Drinking green tea before bed improves your blood circulation. With improved blood circulation, a good amount of nutrients and oxygen can travel in your bloodstream and reach the required body parts. As a result, this boosts stamina and energy levels. To conclude, we can safely say green tea is good for overall health. But, if you want to have a sound sleep at night, you should also stay away from distractions such as cell phones and television. Just sip on a cup of green tea before bed and enjoy a good night’s sleep. For overall health benefits, drinking only green tea won’t help. Make sure you have a lifestyle that includes stress-busting techniques, a healthy diet, and exercise along with a couple of mugs of green tea throughout the day. Is Green Tea Alkaline or Acidic? Miller, K., “Green Tea Puts Sleep Apnea Woes to Bed?” WebMD, May 16, 2008; http://www.webmd.com/sleep-disorders/sleep-apnea/news/20080516/green-tea-puts-sleep-apnea-woes-to-bed#1, last accessed May 11, 2017.